Blankets impact Bethel students from around the world—in school and beyond. November 17, 2017 | 10:30 a.m.
Bethel students and international exchange students from Daystar University pose during the 2016 Mu Kappa fall orientation with their quilts gifted by Central Baptist Church’s Dorcas circle. When Jean (Hayne) McNutt ’60 joined the Central Baptist Church (CBC) Dorcas circle—a Central Woman’s Fellowship group that’s been around as long as one 93-year-old member can remember—she sought ways to expand the quilting ministry. Shortly after, she placed a call to her alma mater and discovered a new avenue for the ministry to make a difference. Now for nearly a decade, Dorcas has joined the longstanding tradition of giving blankets to Bethel students from around the globe. Quilting ministries grew in popularity during the world wars. Afterward, when the demand to send quilts to troops declined, these groups still desired to aid people who were far from home—whether for spiritual, military, or personal reasons. As a result, since the early 1970s, Bethel has received blankets annually for incoming students who grew up outside of the United States. Bethel calls these students “Mu Kappa”—though the origin of Mu Kappa as a designation for students whose parents are missionaries has broadened to include students from a range of backgrounds. Within Bethel’s Mu Kappa group are traditional Mu Kappa or “Missionary Kid,” students, other third-culture students—meaning U.S. citizens who grew up in a different country—and international students studying abroad at Bethel. 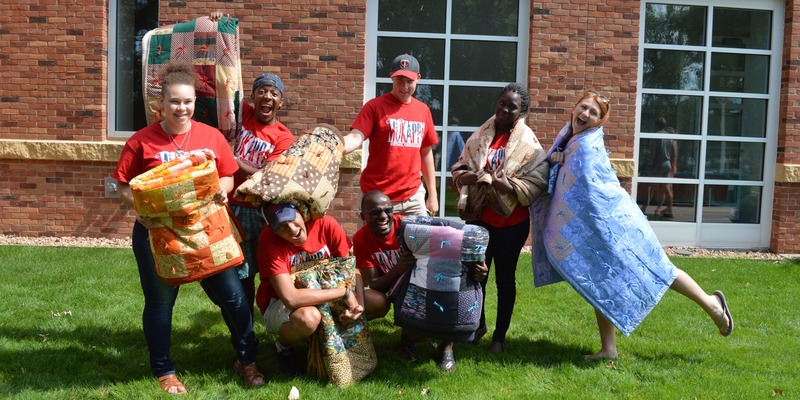 All receive quilts from the Dorcas circle when they arrive on campus as first-year students. “We felt like this was a way to give back and to let these kids know that they’re far away from home, but people are thinking about them,” McNutt says. The term “Dorcas” comes from Acts 9. It’s the Greek name for Tabitha, a woman who helped the needy especially by making clothes. Hannah Johnson ’20, the event coordinator for Mu Kappa, says she’d learned of the blankets before even attending Bethel. “My sister had gone through Mu Kappa, so I’d heard that it was a big deal, and that you get to pick which quilt you want and take silly pictures with them (as a group),” she says. These sort of traditions help foster community for students who have few others with whom to commiserate about confusing American traditions (American football remains a somewhat mind-boggling cultural obsession) and the struggles of having to explain their culture and history. Through their ministry, Dorcas has become another sort of support unit. “It shows we’re thought of and acknowledged outside of Bethel,” Johnson says. This year, for the first time, McNutt had the opportunity to meet some of the students who benefit from her ministry. “It was the most exciting thing for me to be there and see those students and learn of the countries they were from,” McNutt says. “It was just awe-inspiring. It’s such a great group.” Bethel welcomed 15 new students into Mu Kappa fall 2017—making 42 undergraduate students total. 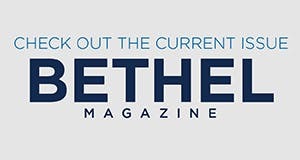 Despite the long history of local churches—primarily ones connected to Bethel through the school’s history with Converge—giving quilts to students, Dorcas is the only group carrying on the tradition today. But its volunteers are happy to continue on. “I’m glad our quilts mean something,” McNutt says. Learn more about international student services at Bethel, or visit the Office of International Studies to plan your own study-abroad experience.